Culture oil may seem like a simple product, but it’s not. Even though it has only one ingredient—mineral oil—it requires extensive processing, testing, and careful handling to establish and maintain its purity. The difference between standard mineral oil and culture oil is kind of like the difference between tap water and ultrapure water. The stakes are high when it comes to culture oil’s purity, because improper processing and handling can introduce contaminants that adversely affect embryos. These potential contaminants are everywhere in the environment, and some of the most common environmental factors—air, heat, and light—can compromise the quality of culture oil. 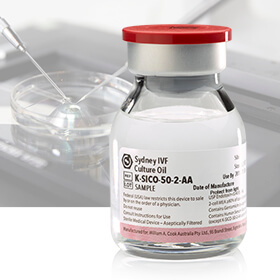 To safeguard the purity of our Sydney IVF Culture Oil, we extensively process, test, and protect it. We start by sourcing pure, highly refined light mineral oil, also known as light paraffin oil. We have validated the biological safety of the oil using standardized biocompatibility testing, including genotoxicity and cytotoxicity; as well as a human sperm survival assay. We test for peroxide toxicity with a specially developed mouse-embryo assay and for peroxide value with a quantitative assessment. And we test for the presence of VOCs. Our careful handling extends to the packaging and shipping as well. We package the oil in smaller vials to reduce the amount of airspace that could promote oxidation, and then package the vials in lightproof boxes. Throughout all of this—before, during, and after manufacturing—we protect the oil from heat, light, and VOCs. We take these measures in order to create a consistent product that you can have confidence in. So, although it’s true that culture oil is mineral oil, it isn’t just mineral oil. Download the white paper (PDF) for technical information about our culture oil and additional references. Cohen J, Gilligan A, Esposito W, et al. Ambient air and its potential effects on conception in vitro. Hum Reprod. 1997;12(8):1742-1749. Otsuki J, Nahai Y, Chiba K. Peroxidation of mineral oil used in droplet culture is detrimental to fertilization and embryo development. Fertil Steril. 2007;88(3):743. Hodgson AT, Levin H. Volatile organic compounds in indoor air: a review of concentrations measured in North America since 1990. Berkeley, CA; Lawrence Berkeley National Laboratory; 2003. Report LBNL-51715.